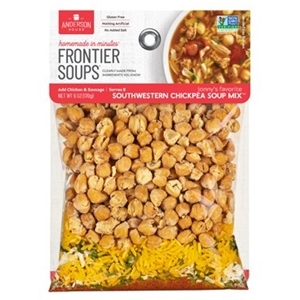 Frontier Southwestern Sausage and Chickpea Stew Mix is a southwestern flavored soup that satisfies the growing preference for bold taste and culinary adventure. The soup combines garbanzo beans, rice, onion, garlic, parsley, paprika and spices along with sausage, tomatoes, chicken broth and chicken to create the flavors of the southwest while making this stew a robust meal. In a 4 quart pot heat oil over medium heat. Remove sausage from casing or purchase fresh bulk sausage not in casing. Saute sausage, breaking up clumps, until thoroughly browned. Stir in contents of Southwestern Sausage and Chickpea Stew Mix. Add broth, tomatoes, and chicken. Bring to a simmer, cover and continue to simmer on low for 30 minutes. Serve with tortilla chips or cornbread. In a 4-quart pot heat oil over medium heat. Saute chicken in oil until browned. Add contents of Southwestern Sausage and Chickpea Stew Mix and stir well. Add broth, corn and tomatoes. Bring to a simmer, cover and continue to simmer on low for 30 minutes. Enjoy this southwestern corn soup with cornbread on the side. Dehydrated garbanzo beans (chickpeas), saffron rice, onion, garlic, parsley, paprika, and spices. *This is not a sodium free food. No salt added. No preservatives or MSG. Nut Free Facility. Certified Gluten Free.